W wieku 84 lat zmarł William Pogue, były astronauta NASA oraz pilot doświadczalny. Brał udział w najdłuższej misji programu Skylab. W 1966 roku Pogue został wybrany do piątej grupy astronautów NASA z 1966 roku. Wchodził w skład załogi rezerwowej Apollo 16. Trenował również do misji Apollo 19, jednak jego lot został anulowany wkrótce po udanym lądowaniu Armstronga i Aldrina. Po zakończeniu lotów księżycowych Pogue został przeniesiony do programu stacji kosmicznej. W latach 1973-74 brał udział w misji Skylab-4, która pobiła ówczesny rekord stałego pobytu człowieka w kosmosie. Z Geraldem Carrem i Edwardem Gibsonem spędził 83 dni na orbicie okołoziemskiej. 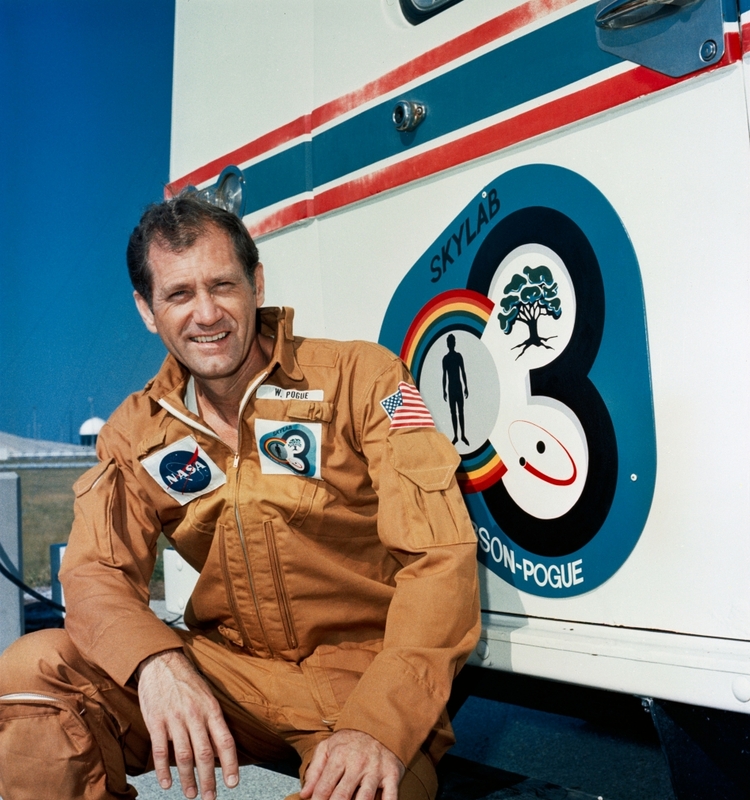 William Pogue, pilot on NASA's Skylab 4 mission in 1973-74, has died. He was 84 years old. Skylab 4 was the third and final manned visit to the Skylab orbital workshop, launched Nov. 16, 1973, and concluded Feb. 8, 1974. 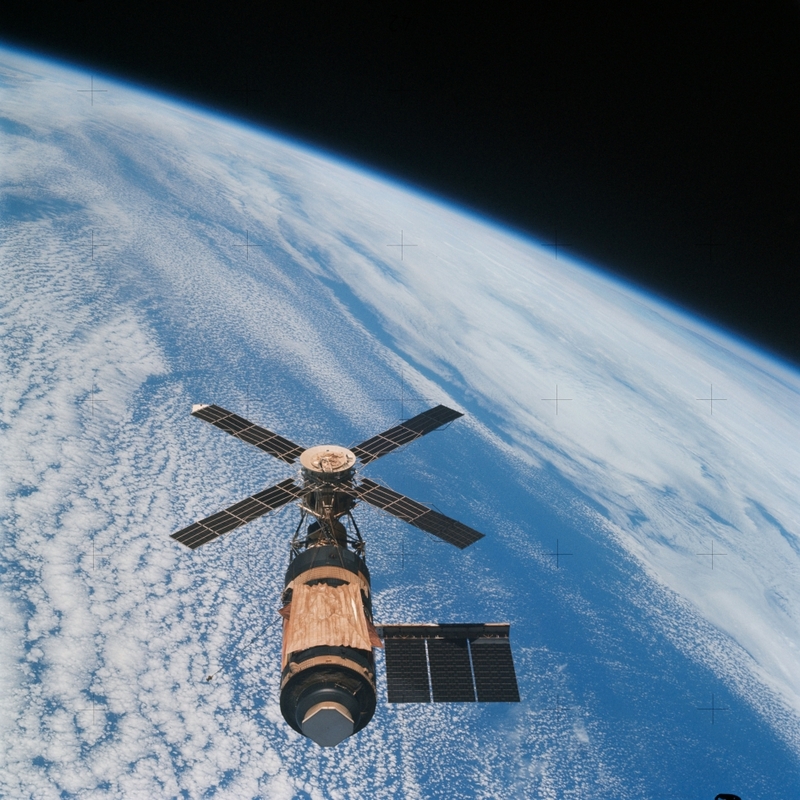 At 84 days, 1 hour and 15 minutes, Skylab 4 was the longest manned space flight to that date. Pogue was accompanied on the record setting 34.5-million-mile flight by Commander Gerald P. Carr and science-pilot Dr. Edward G. Gibson. They conducted dozens of experiments and science demonstrations during their 1,214 orbits of Earth, including extensive observations of the home planet as well as the sun's solar processes. Pogue logged 13 hours and 31 minutes in two spacewalks outside the orbital workshop. Pogue described the excitement of launch in a 2000 interview as part of Johnson Space Center's Oral History project. "I didn’t think we were going to launch. You know, we’d had so many problems. I was sitting there, and finally when we were at thirty seconds, I thought, well, maybe. It's a lot of noise." Pogue said he thought he was "pretty cool" on liftoff, but a NASA doctor later told him his pulse jumped from 50 to 120. "It was pretty exciting," he said. Pogue was born Jan. 23, 1930, in Okemah, Okla. After graduating from Oklahoma Baptist University in 1951, Pogue enlisted in the Air Force, where he went on to fly combat missions in Korea. From 1955 to 1957, he was a member of the USAF Thunderbirds, the Air Force's elite flying team. Pogue eventually logged over 7,200 hours flying time in more than 50 types of aircraft, including more than 2,000 hours logged in space flight. Pogue earned a Master of Science degree in Mathematics from Oklahoma State University in 1960 and served in the mathematics department as an assistant professor at the United States Air Force Academy in Colorado Springs, Colorado, from 1960 to 1963. In 1965, after a two-year tour as test pilot with the British Ministry of Aviation, Pogue became an instructor at Edwards Air Force Base, California. Pogue was one of 19 Astronauts selected by NASA in April 1966. He served as a member of the astronaut support crews for the Apollo 7, 11, and 14 missions before being assigned to his Skylab flight. Pogue was awarded NASA's Distinguished Service Medal in 1974, and won many other awards in his career, including the Air Medal, Air Force Commendation Medal, Robert J. Collier Trophy (1974) and Robert H. Goddard Memorial Trophy (1975). He retired from the Air Force in 1975, and he left NASA in 1977. Pogue later worked as an independent technical contractor for several aerospace and energy firms. From 1984 to 1998 he provided contract technical support to the Boeing Company for the Space Station Freedom program which later evolved into the International Space Station project. 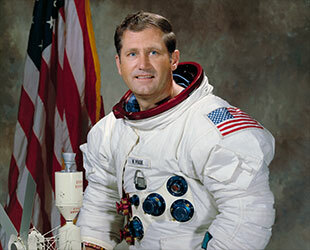 In October 1997, he was inducted into the U.S. Astronaut Hall of Fame at Titusville, FL. March 4, 2014 — William "Bill" Pogue, a United States Air Force Thunderbirds pilot and NASA astronaut who served on the nation's first space station, died Monday (March 3). He was 84. Pogue's death was confirmed by the Association of Space Explorers and Astronaut Scholarship Foundation, to which he belonged. 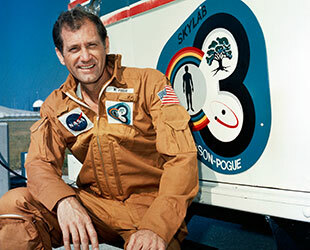 Selected by NASA in 1966 with the agency's fifth group of astronauts, Pogue made his first and only spaceflight as a member of the final crew to man the Skylab space station. Serving 84 days as the command module pilot of Skylab 3 (SL-4) from November 1973 to February 1974, Pogue and his two crewmates set numerous records for the distance they traveled and duration they spent in orbit. At the time, it was the longest human spaceflight in history. "I was scheduled to go to the moon on Apollo 19 but [the] missions 18, 19 and 20 were canceled" Pogue wrote in his 2011 autobiography, "But for the Grace of God." "Instead, I was very fortunate to fly on the final visit to Skylab and spent 84 days in space studying the Sun, the Earth below, and ourselves." "Every third working day," he continued, "one of us served as a test subject for a range of physiological and medical experiments or studies. The work was sometime tiresome and tedious, but the view was spectacular." While living on Skylab, Pogue performed two spacewalks, including a Thanksgiving day outing and an excursion on Christmas 1973 that set a record at 7 hours and 3 minutes long. In total, he logged more than 13 hours spacewalking outside the orbiting outpost — a converted third stage of a Saturn V rocket — while mounting experiments, retrieving film cassettes and taking photographs. 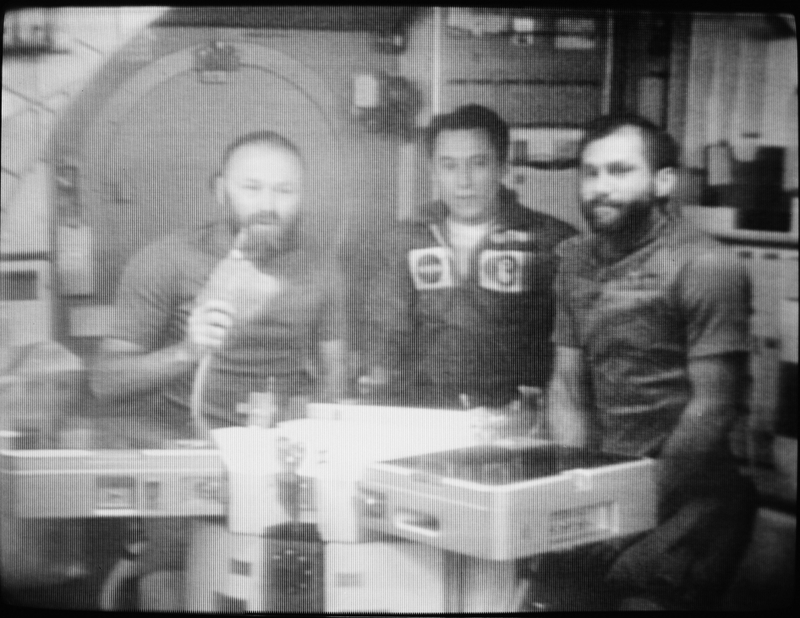 Inside the space station, Pogue and his crew mates, Jerry Carr and Ed Gibson, staged an on-orbit strike, of sorts, six weeks into their stay. The astronauts took an unscheduled day off, in reaction to an overly-ambitious work plan set by NASA's Mission Control in Houston. "We didn't find out until about halfway through [our stay] that we had been overscheduled. We were having trouble" Pogue recalled in a 2000 NASA oral history. "We were just hustling the whole day." The time off, and the compromise they reached with flight controllers, resulted in a smoother workflow. "I recall the last six weeks of the flight were very pleasant to me," Pogue recounted. "We all had a really much better feeling about the whole flight toward the end." Splashing down Feb. 8, 1974, Pogue had circled the Earth 1,214 times and traveled 34.5 million miles in the course of 84 days, 1 hour, 15 minutes and 30 seconds. Born Jan. 23, 1930, in Okemah, Oklahoma, William Reid Pogue earned a Bachelor of Science degree in education from Oklahoma Baptist University in 1951 and a Master of Science in mathematics from Oklahoma State University in 1960. He enlisted in the U.S. Air Force in 1951 and received his commission a year later. In 1954, Pogue completed a two-year combat tour in fighter bombers while serving with the Fifth Air Force during the Korean War. He then served two years as a member of the U.S. Air Force's precision flying team, the Thunderbirds. 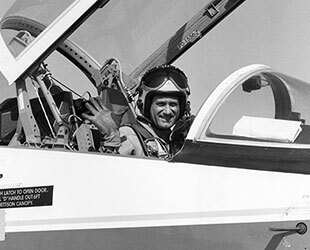 "I flew as solo pilot in the F-84F and F-100C, and, for over a year also in the F-100C, I was slot pilot in the diamond formation," Pogue wrote in his 1985 children's book, "How Do You Go to the Bathroom in Space? 84 Days in Space: American Record." He later was an assistant professor at the U.S. Air Force Academy, and in 1965 completed a two-year tour as a test pilot with the British Ministry of Aviation under a Royal Air Force exchange program. Pogue was serving as the chief of advanced projects at the Air Force Test Pilot School in Edwards, California, when NASA selected him as one of 19 new astronauts in April 1966. Prior to his Skylab stay, Pogue also served on the support crews for the first manned flight for the Apollo command module, Apollo 7 in 1968, as well as for the first and third successful lunar landing missions, Apollo 11 in 1969 and Apollo 14 in 1971. Though never officially announced, Pogue had been slated to fly to the moon as the command module pilot (CMP) on the Apollo 19 mission. "I was going to be on 19 with Fred Haise and Jerry Carr," Pogue said in his NASA interview. "They did not want to announce us, and for good reason, because [our chances of flying] looked pretty bad in Washington, as far as the budget was concerned." Pogue learned of his moon mission being cancelled in the newspaper. "I walked out the door of the motel, and Fred [Haise] was holding this newspaper, and it said, 'Apollos 18, 19, and 20 Canceled.' So that's how we found out about it. Then eventually [chief astronaut Deke Slayton] said, 'Hey, you can't fly on Apollo. Do you want to fly on Skylab?' and of course we all said yes." After returning to Earth, Pogue took part in early tests for the space shuttle, helping to evaluate launch emergencies and develop approach and landing techniques. Pogue retired from the astronaut corps and NASA in 1975 to pursue being an independent contractor for aerospace and energy firms. He retired from the Air Force that same year, having logged 7,200 hours in flight, including 4,200 hours flying jet aircraft. In addition to consulting for the Department of Energy and the Public Service Company of Oklahoma, Pogue served as an adjunct professor at the University of Arkansas and conducted technical work for Martin Marietta Corp. (now Lockheed Martin) in support of the space systems division of Air Force Systems Command. From 1984 to 1998, Pogue furnished technical support to Boeing, helping to develop Space Station Freedom, which in 1992 evolved into today's International Space Station. In this role, he evaluated mock-ups, familiarized workers with the effects of microgravity on crews and equipment, and served as a liaison with NASA Johnson Space Center for spacewalks to assemble the space station. An accomplished public speaker, Pogue wrote five books. In addition to "But for the Grace of God" and "How Do You Go to the Bathroom in Space," he also penned "Astronaut Primer" in 1985 and "Space Trivia" in 2003. Together with science fiction author Ben Bova, Pogue wrote "The Trikon Deception," his only novel, in 1992..
Pogue was awarded NASA and Air Force service medals, among other honors. 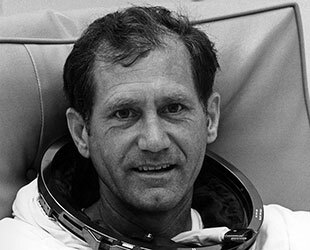 He was inducted into the Oklahoma Aviation and Space Hall of Fame in 1980 and enshrined in the U.S. Astronaut Hall of Fame in 1997. Bill Pogue is survived by his third wife Tina, three children from his first marriage to the late Helen Juanita Dittmar, and five stepchildren from his second marriage to the late Jean Ann Baird. William R. Pogue was the pilot of a record-setting American mission in space, and one of the very few astronauts ever to go on strike — while in orbit — to demand more time for contemplating the universe. Colonel Pogue, who died on March 3 at 84 at his home in Cocoa Beach, Fla., was a member of the three-man crew that flew the longest, and the last, manned mission aboard Skylab, from Nov. 16, 1973, to Feb. 8, 1974. The 118-foot-long space station, designed for scientific research, orbited the Earth from 1973 until 1979, when it ran out of steam and disintegrated (unoccupied) upon re-entering the atmosphere. A sense of the transcendent side of the experience, at the same time, led him to take part in the first and only outer space “strike,” as he and his fellow crew members later referred to it jokingly. The request for time off seemed to puzzle ground controllers at Cape Canaveral, Fla. In news briefings they described it as a possible sign of depression or medically caused lethargy in the crew, which also included Edward G. Gibson, a physicist, and Lt. Col. Gerald P. Carr, a Marine and the mission commander. In his 2011 autobiography, “But for the Grace of God,” Colonel Pogue said the tensions between the astronauts and their ground controllers came to a boil about six weeks into the mission. Unable to persuade their supervisors, they decided to stage their job action. William Reid Pogue was born in Okemah, Okla., on Jan. 23, 1930, to Alex and Margaret McDow Pogue. He told interviewers that ancestors of his were members of the Choctaw nation. 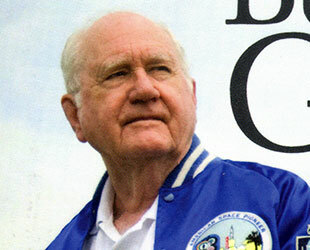 After earning a bachelor of science degree in 1951 at Oklahoma Baptist University, he enlisted in the Air Force and was commissioned a second lieutenant. In 1953, he logged 43 combat missions in Korea. Later in the 1950s he flew as a member of the Thunderbirds, the Air Force air acrobatic team. Afterward he earned a master’s degree in math at Oklahoma State University, taught math at the Air Force Academy and graduated from the Air Force test pilot school at Edwards Air Force Base in California. NASA selected him to become an astronaut in 1966 and assigned him to the support crews for the Apollo 7, 11 and 14 missions. 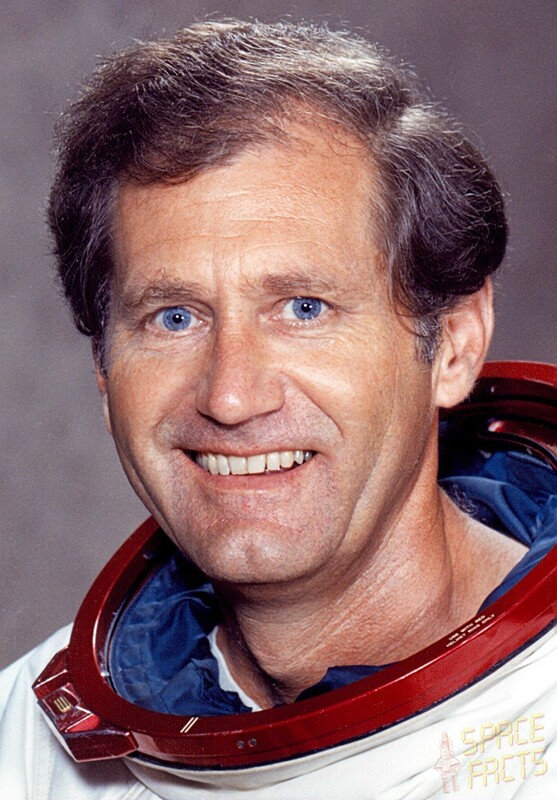 He was appointed pilot of the third and last mission to the Skylab space station in 1973. The mission held the record for the longest spaceflight until 1978, when Soviet cosmonauts spent 140 days on the space station Salyut 6. 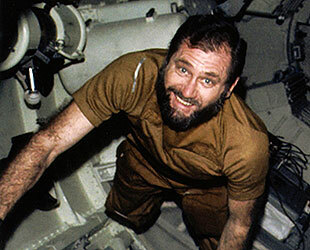 Colonel Pogue conducted more than 50 scientific experiments during the mission and made two forays outside the space station to make unscheduled repairs. Colonel Pogue, whose death was confirmed by NASA, is survived by his third wife, Tina; three children from his first marriage, to Helen Dittmar Pogue; and four stepchildren from his second marriage, to Jean Ann Baird. His first and second wives predeceased him. After retiring from NASA in 1975, he was a consultant to the aircraft manufacturers Martin Marietta (now Lockheed Martin) and Boeing, helping to develop space station technology. He told interviewers that he was particularly proud of contributing to spacecraft improvements in such facilities as toilets, showers, sleeping hammocks, exercise equipment, kitchens and a line of special plastic sacks known in the high-altitude trades as vomitus bags.